Are you passionate about chocolate? Want to learn everything about chocolate? 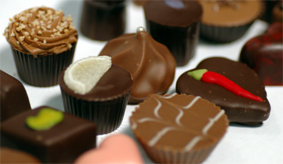 Then our Chocolate Connoisseur Appreciation course is the answer. We will cover everything from the history of chocolate and how it is made through to origins and blends, specialty chocolates and chocolate desserts. Your chocolate connoisseur appreciation evening starts off with a tasting of our special Belgian hot chocolate. Throughout the evening you will taste single origin chocolates, blended chocolates and specialty chocolates made by our European trained chocolatier. A wonderful chocolate gourmet dessert caps off the evening. You will also receive a certificate and specialty chocolate gift pack at the conclusion of the course.